4X strategy game available on Kickstarter and Steam’s Greenlight with a gameplay video, screen shots and plenty more on the way! PUEBLO, Colo. - Feb. 26, 2015 - PRLog -- Lock ’n Load Publishing (lnlpublishing.com (http://lnlpublishing.com/)) and Riveted Games, LLC. are thrilled to kick off Falling Stars - War of Empires Kickstarter (https://www.kickstarter.com/projects/david-heath/falling-stars-war-of-empires) and Steam Greenlight (http://steamcommunity.com/sharedfiles/filedetails/?id=387410923) campaigns. Falling Stars - War of Empires is a 4x turn-based strategy game where players vie for control of the galaxy through politics, space warfare, exploration and more. The game will be available on Windows, Mac and Linux. “We are very excited to be working with Riveted Games and to be bringing this game to the public“ said David Heath, President of Lock ’n Load Publishing. Philip Devine, President of Riveted Games, commented “Lock ’n Load has been great at supporting our project. " 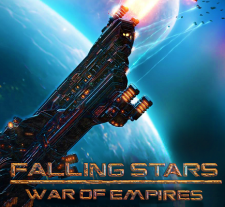 Get more information on Falling Stars - War of Empires from its official product page and be sure to visit our developers forum area (http://forums.lnlpublishing.com/forums/falling-stars-war-...). Check out the gameplay video on YouTube (http://youtu.be/5-3yodxE8Lw) and be sure to subscribe to the Lock ’n Load Publishing (https://www.youtube.com/channel/UClZ6gdcFDfR94LGCmA8Y5Hg/...) channels to see more great promo videos. Box art and other art assets are available from our Press Media Area (https://www.dropbox.com/sh/s7vtwbccl7vytgk/AABLQLbxc220FzrAw6EbtXcNa?dl=0) or by contacting press@lnlpublishing.com (mailto:press@lnlpublishing.com).